We make quilts for all Sororities and Fraternities. These quilts can be made from T-Shirts or fabrics. If you would like a T-Shirt Quilt made from your shirts/sweatshirts, please refer to the T-Shirt page for the corresponding information. 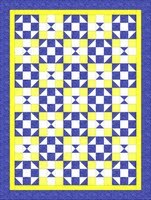 Greek quilts can be crafted using a design of your choice, with the fabrics in your organization's colors. Jersey Girl Quilts is not licensed to use the logos for these groups, but we can place the sorority / fraternaty letters on the quilts. Below you will find examples of the different design choices available. All three choices can be made in Sorority or Fraternity colors. If you would like to see any of these choices in your own organization's colors, please email us and we will be happy to send you a visual sample. Although it won't be an exact match of your own fabrics, it will give you a good idea of of how the finished product witll turn out. 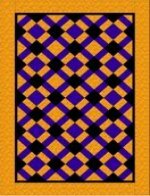 Measures approximately 61" x 92" Measures approximately 60" x 97" Measures approximately 74" x 97"
If you would like to see some more designs you can use for your quilt go to High School & College Quilts. 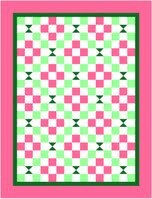 Don't forget that you can request any quilt pattern on the website for your quilt. If you prefer another design than what is presented, just ask. Any of the quilts can be made the size you want and with the appropriate fabric for your theme and age group. The pricing will be modified to fit the size and design requested.